As a medium size, local and family run business, we feel that it is very important to continue to support our community and environment alike. 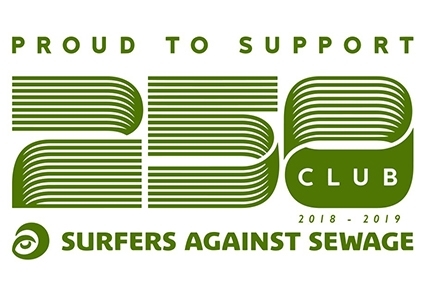 We recently joined the Surfers Against Sewage 250 Club to support the incredible work that they are pioneering towards marine conservation and preserving our much-loved beaches. As we only produce our garments out of natural fibres and draw much of our brand inspiration from our beautiful surroundings, it made great sense to become an active member of the SAS community and we look forward to supporting the cause and getting involved where we can to help save our beaches. Our company Director Nick Whitworth also sits on the Wool Board who manage the Campaign for Wool, an initiative supported by HRH The Prince of Wales as part of his drive for universal sustainability. The aim is to further promote wool as a sustainable and high-performance material. Its properties as a natural fibre make it far superior to man-made alternatives and its benefits to the environment are overwhelming. After undertaking her annual First Aid Training top up course, our Director Kath Whitworth was astonished to discover that the estate that Celtic & Co. HQ is based on does not have close access to a publicly accessible defibrillator in the event of an emergency. On an estate with 42 businesses and around 300 visitors every day, and a concern for her staff and the community driving a need for change, Kath tasked team members to raise half of the cost for a brand-new defibrillator station which her and husband Nick would match to get this life saving equipment installed. Whilst we make every effort to only manufacture garments which our customers can’t wait to buy, some products find themselves left on the shelf. These items are never discarded of - instead we donate them to the Royal Trinity Hospice, so that they can benefit from the proceeds.